It is a moment of great soul searching in modern day finance, as the standards upon which the Wall Street edifice has been built for the last six decades are being manipulated into a form that we thought could never exist. Specifically, central banks around the world have taken the once radical policy of “quantitative easing” (QE) and turned it into an orthodox approach in the post-2008 world. This of course has led to near zero percent interest rates in the US, and, recently, negative interest rates in Japan and several European countries. Based on a post-WW II model that encourages debt-financed consumption at the household, corporate, and government level, central banks have taken monetary policy to an absurd extreme in an effort to bring the traditional business cycle back to life. Thus, investors for the past six years have been valuing holdings not only for their growth potential, but also to avoid the penalty of earning nothing on their savings. In the pre-2008 era, a conservative investor could comfortably earn 3-5% in a money market fund, but no longer. Less than a penny on the dollar is more like it. These savers were “forced” into longer term bonds and the stock market by QE, at least partly so they could avoid the ignominy of earning nothing on their savings. Now that Japan and parts of Europe have taken the “risk free rate of return” to negative levels, is there a logical model to follow in these markets that will allow us to make a rational decision, as the text books say we should? There certainly is no precedent. But it’s as if a “Great Revaluation” of monetary policy and market values are at hand. The key to understanding the financial markets is recognize the importance of the US Federal Reserve’s behavior, and it is here that the first revaluation is occurring. The Fed, of course, raised interest rates a tiny fraction in December. This rise would barely effect anyone’s monthly debt payment, but it sent a meaningful signal that monetary policy has done all it can for the economy, and the shift to normal rates is underway. Fed Chairwoman Janet Yellen told congress recently that while the pace of interest increases might slow, given weak stock markets, their direction was clear: they’re going up. Fortunately, Mrs. Yellen has resisted the calls by clueless legislators to take interest rates into negative territory. We should be reassured by her reluctance to do so, as we can see in Japan and Europe that negative rates have done nothing to stimulate growth. Far from being the stick that drives widespread lending, negative rates have caused banks and investors to run for cover because none of them have any idea what the upshot will be of this policy. Japan’s intent was to depreciate their currency, the yen, in order to make the dollar cost of their goods cheaper on world markets. But the opposite occurred, with the yen appreciating strongly in recent weeks, contrary to the Bank of Japan’s goal. This has left their credibility damaged, and their central bankers without any ideas other than doing more of the same (isn’t that the definition of insanity?). In many respects, we have reached the practical limit of what monetary policy can do for modern economies. The role of central banks is to control the “price” of money (i.e. short-term interest rates), and since the 1940s economies have more or less responded in predictable ways to the cyclical moves in interest rates. With rates now at the zero boundary, and below, and with QE still the monetary policy du jour overseas, economists are increasingly revaluing the efficacy of modern monetary policy. It’s clear now that rising asset prices have not lifted the boats of households who don’t own homes or stocks, so not all segments of the population have benefited from QE. National economic policies are also reaching a revaluation point, too, as a result of QE’s mixed success. Having exhausted the ammunition available from monetary policy, the next economic slowdown will have to be countered by the fiscal side, i.e. government spending. Fiscal hawks are being painted into a corner by Yellen’s resolve to normalize rates and her reluctance to go negative. The Fed, she says, has done all it can for this cycle. Thus, if recessionary winds start to blow, the pressure to boost government spending will be acute. The Fed has given congress a free ride for the past six years, allowing them to avoid tough guns vs. butter decisions. But those days are coming to a close as monetary policy reaches the point of diminishing effectiveness. Wall Street is facing a revaluation of the environment it has come to love. The boost from QE has now begun to fade, and since mid-2015 more and more stocks have faltered. The reality that stocks must now rely on fundamental factors to maintain the bull market, rather than the artificial boost from QE, was brought home in 2016 as markets had their worst start to a year ever. Usually, the early part of the year is one of optimism for strong business prospects and renewed growth. In 2016, however, the prospect of a global slowdown has weighed heavily on stock prices, which are firmly in negative territory for the year to date. One sign of the new reality on Wall Street is the reaction to European and Japanese central bank pledges to do “whatever it takes” to stimulate those anemic economies. Over the last three years, these words would literally have been a rallying cry, boosting share prices as the prospects for more money printing ensued. This year, markets fell on these same central bank reassurances, perhaps signaling Wall Street’s skepticism that more QE and negative interest rates will not have much positive effect at this point. Wall Street is also revaluing its relationship with the Fed. Since the days of Greenspan’s appointment in 1986, every hiccup in the market has been met with the Fed opening the liquidity spigots. From the 1987 crash to the Asian currency crises of the late 1990s, through to the Internet bust and the mortgage bubble of 2008, the Fed has been there to staunch the flow of red ink. But in mid-2015, Mrs. Yellen sent a message to Wall Street: no more bailouts from the Fed. Perhaps this was simply a realization that the practical limit of cheap financing has been reached, or more philosophically, that QE has disproportionately benefited the securities and real estate industries rather than Main Street. Whatever the reason, investors can no longer count on a knee-jerk liquidity injection from the Fed every time the going gets tough for stocks. In this sense, we are getting back to normal. We have gotten accustomed to the bullish markets of the last six years, and it is easy to forget the outsized influence that QE has had in fostering that bullish era. 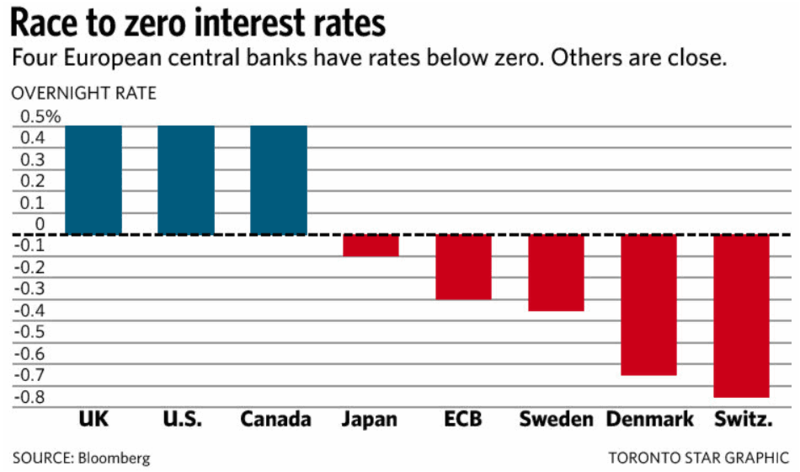 But it was in fact an aberration brought on by the widespread implementation of QE globally. As the effects of QE are now fading, Wall Street is moving back into a more traditional mode of behavior, and this is a good thing. What are the implications of this move to normality? First, we can expect market corrections to become more frequent. These drops of five, ten, or fifteen percent were absent from the period 2012-2015, when QE 3 was running at full speed ($85 billion a month of money printing). Investors enjoyed four long years without so much as a ten percent correction in stocks. Since mid-2015, we’ve had two corrections of that magnitude. But this is not a cause for despair, but rather of relief, as corrections have a cleansing effect on markets. They get rid of the excesses that typically build up in bullish periods, not only ensuring that ridiculous valuations are cut down to size, but also to keep crowd euphoria in check. A healthy skepticism is necessary to promote an investing mentality among market participants, rather than feeding a speculative trading mentality that one-way markets encourage. Moreover, corrections make people think long and hard before committing their risk capital, a consideration that was in short supply during the QE years. The role of leverage (borrowing) in the markets is also affected by the return of normality. Leverage in the markets works much the same as leverage in buying a house. By borrowing, we can afford more house than if we had to pay all cash. As house prices rise, our equity in the house rises, as the debt is slowly amortized with each monthly payment. The gains on our cash investment in the house are magnified by the effects of borrowing. Similarly, when leverage is used to buy stocks in a rising market, the gains are magnified. In a world of low interest rates, it is cheap to borrow, and cheap financing has helped stocks to rally almost without interruption, resulting in a win-win situation for speculators. 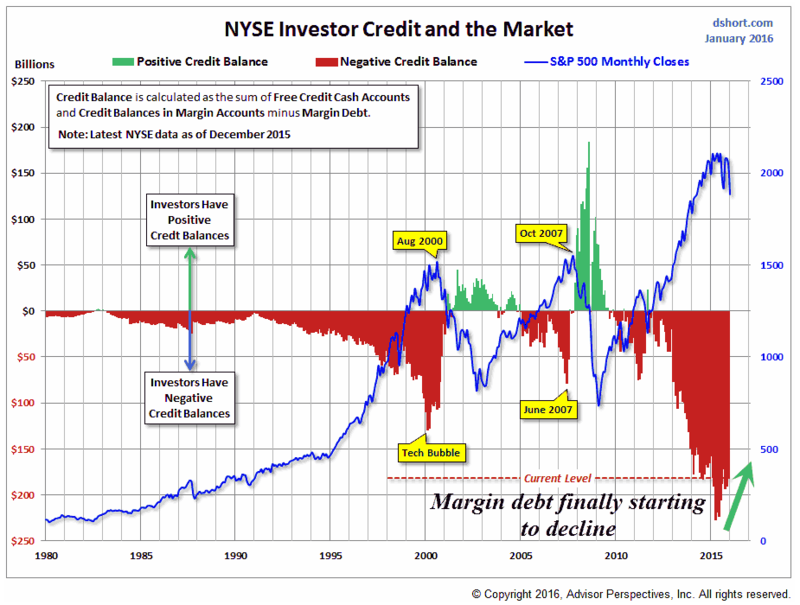 Thus, the use of borrowed money, known as “margin” on the stock exchanges, has ballooned in recent years. The return to normal market volatility has reduced the appeal of leverage, as price declines also magnify losses for investors using margin. Unlike a home owner, who can ride out a period of falling home prices, stock investors are required to bring their level of borrowing into a prescribed ratio by the brokerage firm, known as a margin call. This can be done by adding cash to the account, or selling the position and paying off the margin borrowed from the brokerage. The dark side of leverage becomes a lot more apparent as corrections become more frequent. As the chart on page 2 illustrates, margin debt has expanded broadly over the last six years, and is now beginning to shrink. This shrinkage is a natural response to rising volatility, and is a major factor in the poor returns that have characterized the start of 2016. Investors are simply too highly leveraged and they are selling positions and reducing their margin debt. Though it is a positive in the long run, the liquidation of margin debt has the potential to hang over the markets for the balance of 2016, keeping downward pressure on returns until margin comes down to a more sustainable level. Finally, the market appears to be revaluing the level of “valuations” of stocks. Valuations are a topic of incessant debate among security analysts, underscoring the fact that there is no agreed upon metric for what constitutes a “cheap” or “expensive” stock market. The chart below, produced by Doug Short (http://www.advisorperspectives.com/dshort/), is an effective compromise as it takes the average of four valuation measures and compares them to their long-term averages (solid red line). 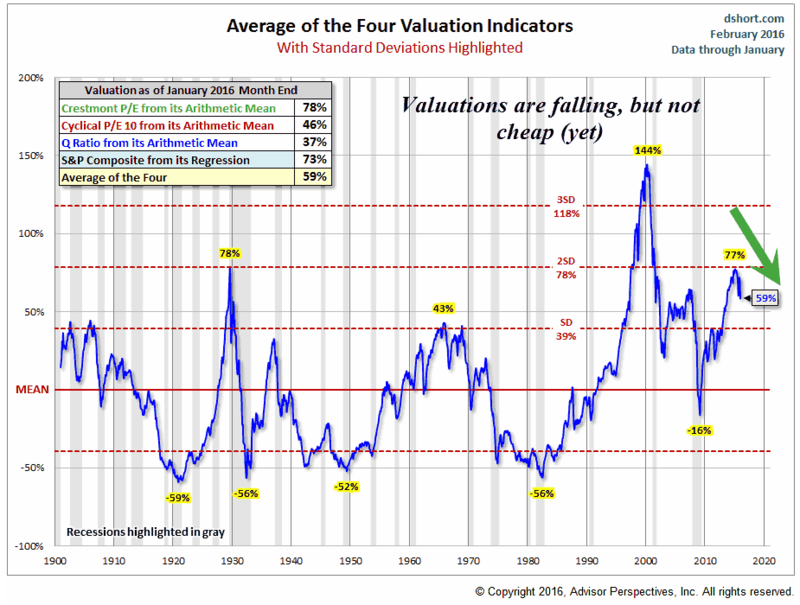 The presentation measures how far away from the average today’s valuations are, as measured by the standard deviation from the mean. The peak for this bull market was in May 2015. At that point stocks were 77% above the mean (or 2 standard deviations), surpassing all previous peaks except 1929 (78%) and the all-time high in 2000 (144%, or more than 3 standard deviations). Given what happened subsequent to those peaks the recent high water mark provides little comfort to those concerned about the high valuations placed on stocks. Today’s reading is at 59% and falling, indicating the revaluation has begun. Here, too, we can say that the extremes we have witnessed over the past few years are beginning to dissipate, and that is good news for long-term investors. By mid-2015, valuations had reached levels that indicated all the good news about the economy and interest rates had been baked into stock prices, and long-term return expectations must necessarily be below average. Despite the correction that has started 2016 we are still not at the point where stocks can be considered cheap, despite Wall Street’s assertions to the contrary. Market valuations and margin debt are long-term measures that are good at assessing the level of risk, but not so useful for short-term perspectives. For that we turn to our trusty advance/decline (A/D) lines and “Bullish %” indicators. These have the advantage of telling us what investors are actually doing with their money, rather than being based on some sort of tenuous forecast of the way things “should” be. The two NYSE advance/decline measures are actually telling somewhat divergent tales. 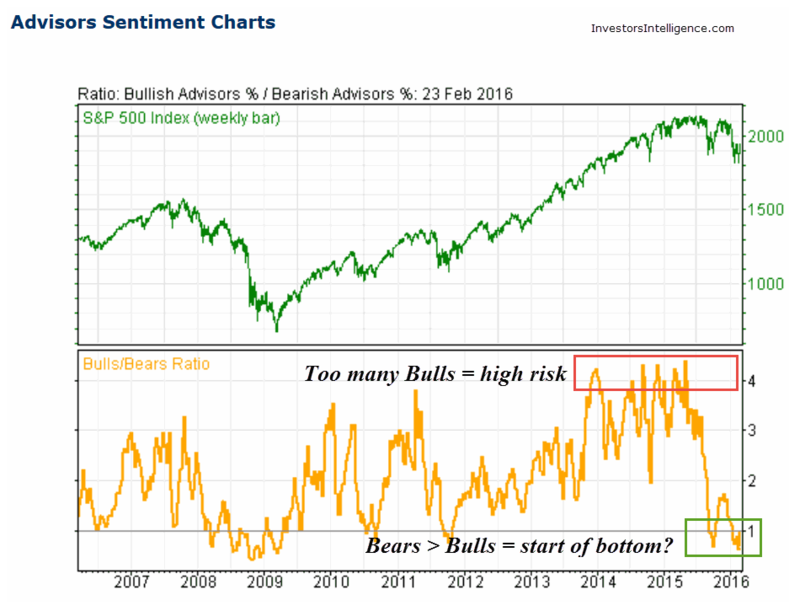 Both were decidedly bearish from December to mid-February, with unambiguous sell signals. The weekly A/D line (below, left) continues to hold its sell signal from September 2015, and the weak start to this year has pushed the chart to a lower low. The “down staircase” pattern that has developed tell us that we should not expect the weak market to bottom right here; it will take some time for this chart to turn bullish. Market pundits are falling over themselves in an effort to pick the bottom, as corrections over the past few years have been quick and relatively painless affairs, so they assume this one will be, too. But the persistent downward trend of the weekly advance/decline line tells us that they are premature in declaring today’s lows a buying opportunity. Recent volatility, however, has moved the daily A/D line (above, right) to a minor double top buy signal, which may be a portent of better market trend to come. The daily A/D line is quicker moving, and will start to improve before the weekly version does. Looking at the chart one can see a clear pattern of lower lows and lower highs that has developed since June 2015, and it is this bigger picture pattern that investors should keep their eyes on. It is a signal of overall weakness in stock prices, and a sign that the majority of stocks are continuing to move down in price. A break of the current resistance line (descending red line) would be a welcome bullish development. From today, it would take several weeks of net daily advances to breach this line, therefore the period from now to the end of March will be key to knowing whether the bearish trends that started 2016 are being reversed, or will continue into the spring. So while this is a significant positive development, it has more work to do to signal the “all clear” for stocks. The NYSE Bullish % (below) measures the percentage of stocks on the New York Stock Exchange that are on buy signals, based on point-and-figure charts. It has been tracing out a pattern of lower highs since 2013, indicating the waning ability of most stocks to shift to buy signals. The weak start to the year pushed this measure solidly into oversold territory in January, reaching a low water mark of 20%. 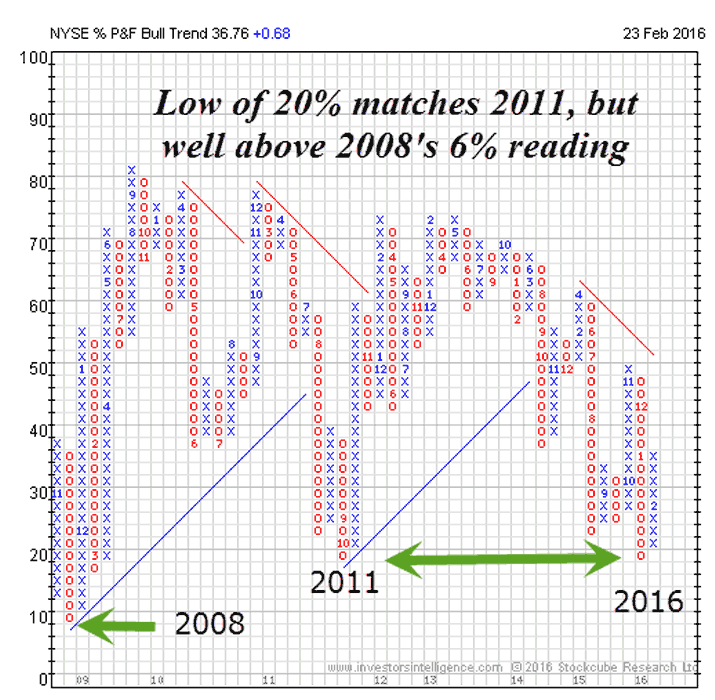 This matched the correction low of 2011, but is still well above the 2008 bear market low of 6%. The fact that it is a rising column of Xs indicates that an increasing percentage of stocks are moving to buy signals, the most basic requirement for a bull market. The fact that it has rebounded from recent lows is cause for optimism, and we should expect to see some back and forth movement at these low levels before a buy signal is given, which would be a decidedly bullish signal. For now, however, it is telling us we are experiencing a rally in an overall bearish market trend, so caution is still in order. Finally, there is reason to be happy based on the despair advisors are feeling at the moment. Advisor sentiment, as compiled by Investor’s Intelligence (www.InvestorsIntelligence.com) , has shown a major decline in bullish sentiment, and a commensurate rise in bearish attitudes. Back in mid-2015, we cited the high level of bullishness as an indication of overly optimistic expectations for market performance, and while the high level of bullishness lasted quite a few months, it was an accurate measure of the high risk at the time. In fact, most stocks and indexes peaked in mid-2015, when the ratio of “bulls” to “bears” was about 4 to 1. This high ratio of bullishness implied a fully invested stance, with little cash remaining in investors’ pockets. The back-to-back market swoons of August and now January have reversed investor attitudes dramatically. Today, for the first time in five years, bearish advisors outnumber bullish ones, with the ratio of bulls to bears at 0.9 to 1. This is relatively rare, as Wall Street is an inherently bullish place, and bullish psychology tends to be the prevalent view. So the fact that we’ve seen a significant shift to the bearish camp tells us two things. First, risk in the stock market has dropped significantly, as skepticism causes people to be more reluctant to take risks, and more inclined to take a short-term view of investing. This, of course, is the result of stocks falling and the negative media explanations that result from that decline. But stocks have become better (not great) values than they were when bullishness was rampant. Second, it implies that cash is building up on the sidelines as a result of this bearish outlook. This is the future fuel for the next bullish leg up in the market. As that cash is put to work, the demand for stocks increases, pushing up prices. 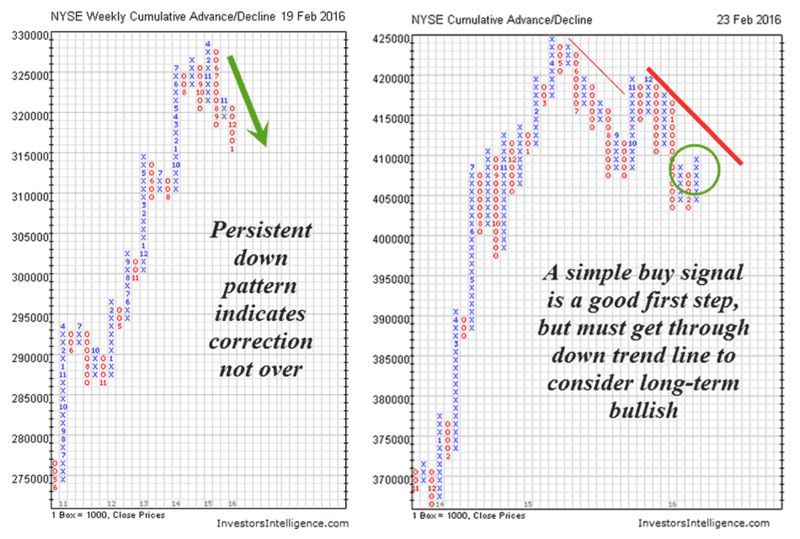 The caveat to using bullish/bearish sentiment is that sentiment can persist for quite a long time before the contrarian expectations of such analysis is realized. 2015 is a case in point, as high bullishness persisted for almost a year before the market ran out of gas. One obvious factor that could keep sentiment on the gloomy side is the presidential election. In election years investors have a tendency to take a wait-and-see attitude to investing, believing that knowing the winner will somehow clarify the best investment path to take. Usually, though, the market bottoms ahead of the actual election, as if the imminent resolution of the presidential question is enough to lift the veil of uncertainty hanging over the markets. So it is possible we could see bearishness prevail into October. That said, today’s bearish mood is a good start to getting to the ultimate bottom of the correction that is now unfolding.